Have you heard of a cronut? Chef Dominique Ansel packages croissant-doughnut hybrids (known as "cronuts") at Dominique Ansel Bakery on June 10, 2013 in New York City. 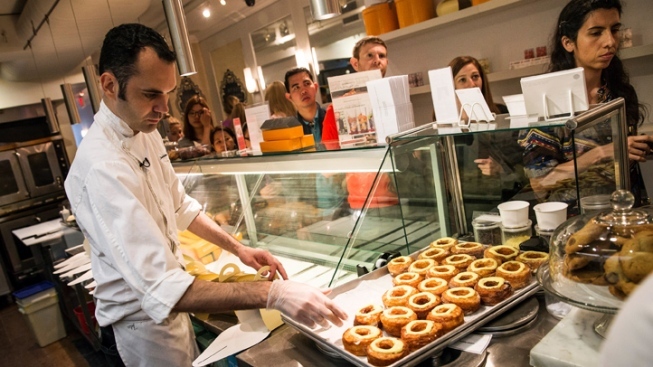 The bakery makes 200-250 of the cronuts daily, which have been in hot demand since they were introduced in May. The New York Cronut craze has hit the Bay Area with San Francisco bakeries selling out recently as many locals order the hyped-up hybrid croissant-meets-doughnut pastry by the dozen. The croissant-doughnut creation was born at Dominque Ansel Bakery in Manhattan this spring and has since been trademarked as its popularity soars and pre-order lists grow. The trendy treat has made its way westward in the past few weeks, with downtown San Francisco coffee shops offering Cronut-inspired "cronots" made by Santa Clara-based wholesaler Posh Bakery. At Java Trading Co. at 100 Fifth St., owner Fi Li started ordering cronots from Posh Bakery in early July on Fridays only. Two weeks ago she decided to order them everyday as demand increased. "Usually people come in and want to buy a dozen," she said this morning. She said during the morning rush they often sell out, but as she has increased her orders more customers purchase them up until closing. She said she first heard about the hype in New York in late June and saw that Posh, which delivers other baked goods to the ground-floor shop at the San Francisco Chronicle building, was offering the cronot. The sugary treats are $3 each and come in flavors including chocolate, cinnamon, glazed and strawberry. Many are filled with custard. One patron this morning was trying his first cronot and decided on chocolate. James Seraphine, who works at the Chronicle, said he had heard about the novelty breakfast item from friends in New York. After a few bites he said, "it's perfect," if a bit decadent. He said, "I'd get it again" and was eager to tell his East Coast friends that he had tried the West Coast version. At one of the several locations of Lee's Deli scattered throughout San Francisco's Financial District had the Posh Bakery cronots packaged in boxes lined along the cash register at 615 Market St. this morning. Owner Sterling Quan said his store goes through four- to five-dozen cronots throughout the day. He started selling them three weeks ago. "It's going pretty well," he said. He orders the baked goods daily and he said some days his location will sell out, especially when he receives orders for 10 in one purchase. He said certain croissant elements, such as the multiple layers and that the treat is "flakier than a doughnut," adds to its popularity. After Posh offered Lee's locations to sample the item, Quan said he "wasn't aware how big they were" and then discovered people were lining up in New York to take a bite. At his store, "people are disappointed if we're sold out," so he has been upping his orders each morning. The Fillmore Bakeshop, located at 1890 Fillmore St., made a batch of their own recipe for Kronuts last Saturday and quickly sold out. The bakers have decided to offer the cinnamon-sugar covered pastries every Saturday between 9 a.m. and 10 a.m. On the bakery's Facebook page, the owners posted after Saturday's inaugural Kronut sale. "Kronuts were a huge success!! Thanks for everyone's patience, we can only fry 6 at a time, but making them in such small batches is what makes them so special!" they wrote. At the original New York bakery, the Dominque Ansel website has a "Cronut 101" page with details about the pastry that the bakery has dubbed the "most viral dessert item to date."